ALSO KNOWN AS the Hungarian Plain, the Pannonian Plain is one of the flattest parts of Central Europe and one of the most agriculturally productive. The plain occupies a wide depression between the Alpine ranges to the west and south and the Carpathian chain to the north and east. At its greatest extent, the plain covers all of HUNGARY, eastern AUSTRIA, northern CROATIA and SERBIA, and southern CZECH REPUBLIC. The central feature, the DANUBE RIVER, divides the plain roughly in half, with the larger portion forming the Great Hungarian Plain to the east (known as the Alföld), and the smaller portion, the Western Lowlands (or the Little Hungarian Plain, the Kisalföld). To the south, the plain merges into the more hilly terrain of the Balkan Peninsula (where the DANUBE merges with its largest tributaries, the Tisza, the Mur, the Drava and the Sava), while the west rises slightly in elevation at the foothills of the ALPS on the frontier with Austria. 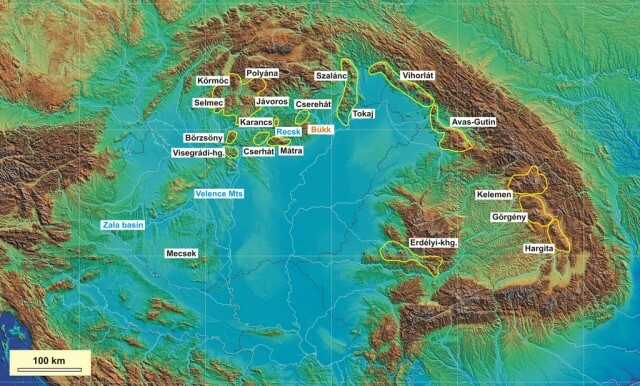 The Danube floodplain south of Budapest can reach 12 to 19 mi (20 to 30 km) in width. A high rise between this floodplain and that of the Tisza River to the east is also a division between the eastern and western portions of the plain. This elevated ridge (only about 165 ft or 50 m) is mostly formed of sand dunes and LOESS hills, such as those at Gödöllö or Nagykörös. Several million years ago the area was covered by the Pannonian Sea, which accounts for the richness of its soil, formed from organic sedimentary deposits, at points a kilometer thick. The western segment of the plain still includes a large water-filled depression, Lake Balaton, which, at 233 square mi (598 square km) is the largest lake in Europe in area (though not in volume, since it is very shallow). The eastern plains spread out for miles of almost completely horizontal fields and grasslands, or puszta, with rich soil formed from alluvium deposited by the Danube and Tisza rivers. This region is sparsely settled, populated instead by herds of horses and cattle, and covered with farms. The plain takes its name from the Roman province of Pannonia. This frontier province along the Danube was established in 9 C.E. but not really settled until the early 2nd century by Trajan. The Romans built cities like Vindobona (Vienna) and Aquincum (Buda), but the province was settled not by Romans, but by waves of “barbarians” from the east: Ostrogoths, Lombards, Avars, Huns, Slavs, and finally by Magyars, better known today as the Hungarians.